You say summer, I say corn! Is it me or does that sound vaguely dirty? The seed for this recipe was planted one Friday evening at the Fresh Choice Market in Lomita CA. I drive by this newish grocery store on PCH every day on my way to work (and sometimes on my way home). Unfortunately, it’s closed when I’m driving in and on the wrong side of the street to easily stop into on the way home. So, it wasn’t until one early Friday evening that I finally had a chance to experience the Fresh Choice Market. To quote Stefon, “this place has everything!”: panderia, Jerusalem bread shop, baklava station, insane carniceria, crazy exotic produce section, aisles and aisles of international ingredients that I’d previously only been able to order. I wasn’t the only person with conchas on my mind that Friday–the place was packed with all kinds of people. After slowly perusing the market, I somehow ended up with a cart full of interesting odds and ends I had no idea I needed. Among them was a pouch of honey powder. 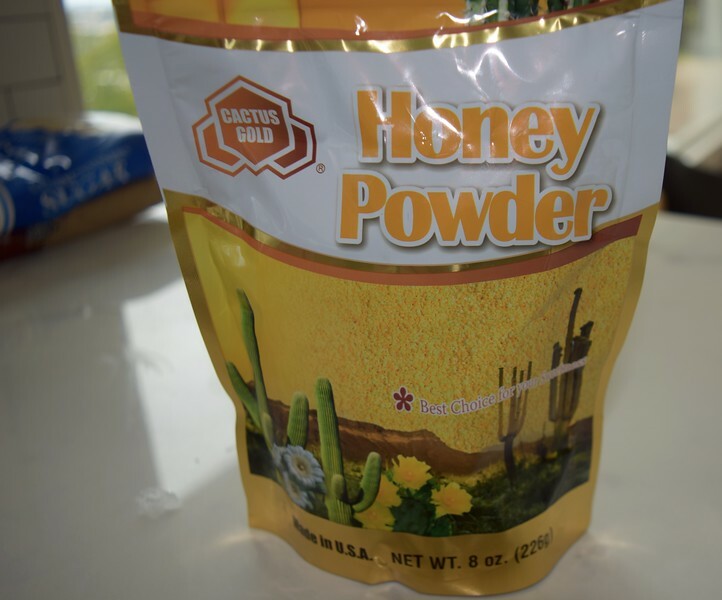 Per its name, honey powder is just dehydrated honey and can be used as a sugar substitute. I’m always on the lookout for new things to put into French macarons so I grabbed a bag. With the Via Corona renovation wrapping up, much of my free time is still spent on “house stuff” so macarons won’t be on the agenda until late summer. But regular cookies I can do. I love Christina Tosi’s corn cookie recipe and have been looking for excuses to play with it some more. Honey powder was my in. 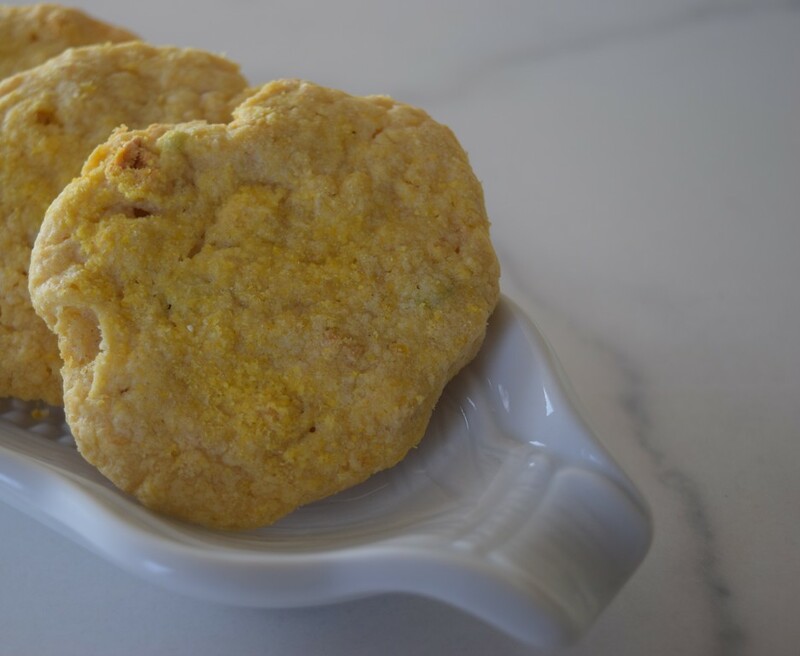 Honey, corn and jalapeno are great friends in a biscuit, corn bread or scone so why not a cookie? I replaced some of the sugar with the honey powder and then infused a diced jalapeno into the remaining sugar. In addition to using the freeze-dried corn powder in the original recipe, I also threw in some whole freeze-dried kernels for additional texture. 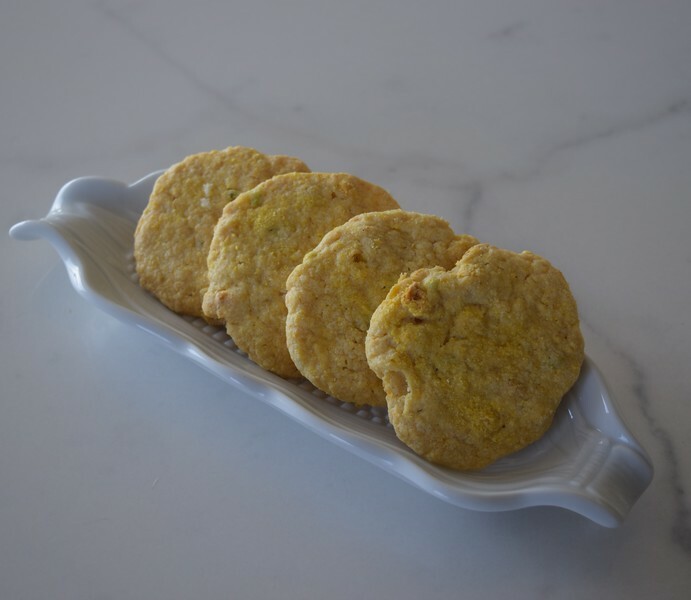 And there you go: you say summer, I say corn (honey, jalapeno cookies)! So I have an admission to make about these cookies. While I thought they were fun and tasty, when it came to offering them up to others, I completely chickened out. I had a box ready to go in to work and couldn’t bring myself to bring it in. The box sat on my counter for three days until I gave up and threw it out. 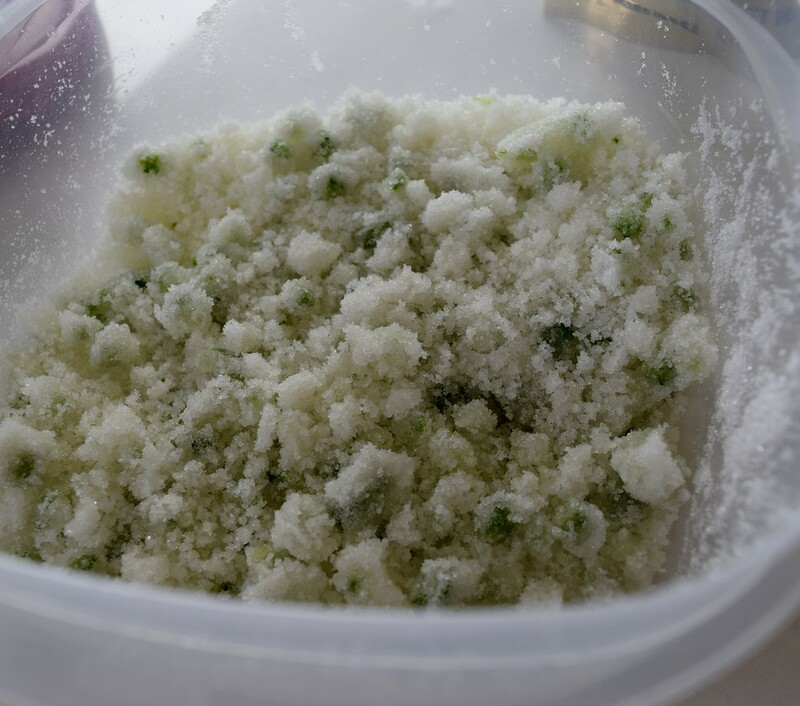 Finely chop jalapeno (de-rib and de-seed), combine sugar and chopped jalapeno into an airtight container. Shake to distribute and allow to mingle for at least 30 minutes. Cream together butter, sugar and honey powder using the paddle attachment of a standing mixer or an electric mixer on high for 3 minutes. Reduced the mixer speed to low and add the flour mixture, combining until the dough just comes together (no more than a minute). Fold in the corn kernals by hand. Bake for 10-12 minutes. Cookies will puff, crackles and spread. Done cookies will be faintly browned on the edges but bright yellow in the middle. Next Next post: Via Corona Exterior: You Need A Montage!